Channel Divinity – Tech Manipulation – When take this Oath at level 3, you can use your channel divinity to try to take control of a technological device as an action. Just like with spells, enemy machines must make an Intelligence save against your channel divinity (using charisma for save modifier. If they fail, they are under your control for 1 minute. Once this effect ends, you must use Technology/Intelligence checks to continue to hack the machine. Faith in Maxson – Upon reaching Level 7, you gain proficiency with Steel Oath Powered Armor. Now, earning the right to have your own pair of armor is another more social and political matter. If you have already taken a feat to use Powered Armor, you instead gain the following benefit: While wearing Powered Armor, you can add your Dexterity modifier to your AC if you choose. You also don’t take Disadvantage on Stealth rolls. Wasteland Proof – Your training in the outside world has hardened you against deadly poisons and horrible toxins as you reach level 15. You are still resistant to Necrotic and Radiant Damage (alternatively: Radiation Damage) if you are not wearing powered armor. You are immune to this damage if you are wearing it. In addition, you can use Protection from Energy at-will, without spending a spell slot. Immunity to Poison damage and Poisoned condition; Resistance to Cold and Fire damage. You automatically succeed checks for identifying/understanding technology. You must take a long rest before using this ability again. 750 GP; 17 AC; Req. 13 STR; Disadvantage on Stealth; 50 lbs. ; Resistance to Radiant & Necrotic damage (or just “Radiation Damage”) while worn. The Blast Rifle is a state of the art hunting rifle used for more distant troopers. The Laser Pistol is a standard issue front line weapon seen on nearly all paladins of this oath. The Plasma Cannon is a special weapon designed to launch grenade like explosives from a fair distance. Upon touching down, all creatures within 10 ft. of the target must make a dexterity save or take the same amount of damage;success = half damage. Weapons with this property run in charge-like devices rather than normal ammunition. You must use a long rest to charge this kind of weaponry. AUTHOR’S NOTE: I’m a HUGE fan of the Fallout series and this Paladin order is dedicated to the Brotherhood of Steel faction from the games. Created by Doctor Necrotic for Doctor Necrotic Media. Based off the Brotherhood of Steel from the Fallout video games. 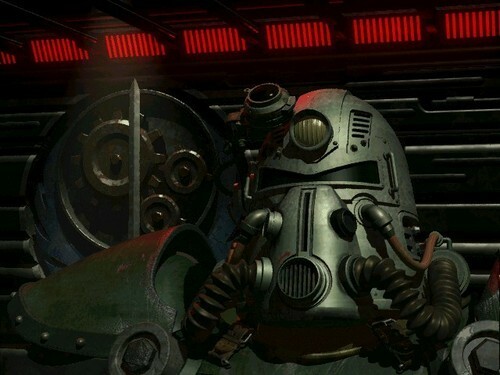 Fallout is a property of Obsidian Games and Bethesda.